Puncia Granatum (Pomegranate) is an unusual one for us hear at Premier Bonsai. We haven't had many of these available in the past. This tree was imported from Japan this year and has a great shape and branch placement. These trees should be grown outside and do well in full sun but need protection when the temperature drops below 5oc. This tree looses its leaves during the autumn. Puncia Granatum can die back when wired so the clip and grow technique works best to develop these trees. Keep the tree damp as droughts can seriously harm the tree. They also grow well when slightly pot bound. 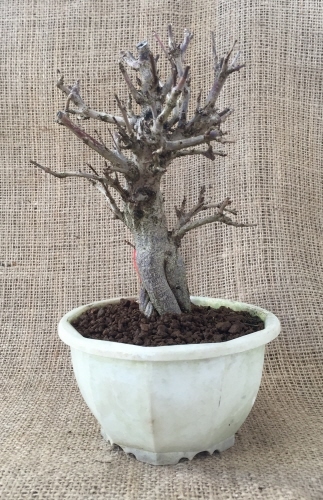 The tree sits about 15cm above it's plastic training pot and is about 10cm wide. The trunk base measures about 3cm. The pot measures 12x7cm. - This plant prefers full sun. The sunnier it is, the more water it needs. - This tree likes to be kept damp.